The Red Sox' offense didn't need warm weather or more time or new players. It needed a challenge. Brad Penny's second-inning implosion last night - three walks, three singles, a grand slam, and seven runs before the second out - should have doomed the Sox before the beer vendor's first case ran out. The touchdown deficit only provoked them. The Sox, averaging 4.1 runs per game, hung four in the second inning. J.D. Drew hit a solo home run in the third. They tied the Orioles by the fifth, led by the sixth, and notched a madcap, 10-8 victory in front of 38,266 at Fenway Park. They forged their first consecutive victories of the year with a second valiant bullpen performance in a week and an offense that recharged Fenway, which had sat dormant for a week. In the clubhouse afterward, Jason Bay and Dustin Pedroia ate dinner together. Bay looked at Pedroia and said, "We're not really talking about the fact that we were down, 7-0, and we won that game." The remarkable thing about the game was not the seven-run comeback. It was how routine the Red Sox made it feel. "That's something most guys forgot about, didn't really soak it up yet," Bay said. "At the end, it was no big deal. But that could potentially be a season-changing game in a lot of aspects. Whether it's the offense getting going, whether it's us getting one more win instead of one more loss, it could be a lot of things." Chatter concerning the demise of Boston's offense, a primary culprit during a 2-6 start, seems premature now after the Sox exploded for at least eight runs for the second straight game. Baltimore's defense, which allowed the three unearned runs that tied the game at 8 and abetted a few more, helped. Drew and Bay served as the main cogs. Drew hit a home run and a triple, walked three times, and scored three runs. Bay hit a two-run homer and drove in three runs, including the go-ahead run in the sixth on a sacrifice fly to center that plated Pedroia. 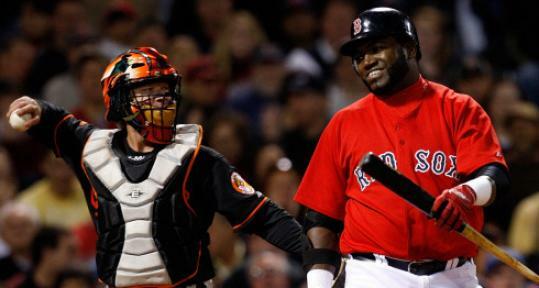 The Sox put up 10 runs despite David Ortiz and Kevin Youkilis going a combined 0 for 8 with five strikeouts. "I don't think it's fair to think every guy in our lineup is going to be firing at all times," Bay said. "But we have the ability to have two or three guys not on their games and still put up a lot of runs." Because Penny's night ended before he recorded an out in the fourth inning, the Sox relied on their bullpen, fresh thanks to Tim Wakefield's complete game Wednesday and a day off Thursday. Manny Delcarmen pitched a career-high 2 2/3 innings. Ramon Ramírez erased Javier Lopez's sixth-inning mess by stranding two runners with one pitch, then mowed through a 1-2-3 seventh. Ramírez found trouble in the eighth and yielded to Hideki Okajima, the lefthander chosen to face lefties Nick Markakis and Aubrey Huff with two men on. Markakis drove a fly to deep center, pushing Jacoby Ellsbury to the warning track and the runners who could tie the game to second and third. Okajima worked a 2-2 count on Huff, then struck him out swinging with a devious changeup. "It's a hard way to play, unloading your bullpen like that," said Red Sox manager Terry Francona. "But I think they deserve us to do that. You almost feel an obligation to the players out there because of the way they're trying to get back into the game." The bullpen gave the offense time to mount an assault; it didn't need much. The Sox leaped back into the game with Bay's two-run homer to right in the second. "If you come out and roll over, it kind of sets the tone," Bay said. But two plays in the fifth proved pivotal. Jason Varitek came to the plate with the bases loaded - Jeremy Guthrie had retired seven straight before Drew tripled and Bay and Mike Lowell followed with walks. Varitek shot a two-hopper at first baseman Huff, who let the ball bounce off him as he dropped to his knees. Drew scored, and the inning continued. Nick Green took advantage by denting the center-field wall with a double, driving in the two runs that tied the score. Penny's disintegration unfolded suddenly, the scenes devolving: Ty Wigginton and Luke Scott were leading off with consecutive singles; Penny was chucking pitches everywhere but over the plate; two runs were walking home; Hunter Jones was throwing in the bullpen; Penny was taking off his hat and wiping sweat off his forehead; Markakis was coming to the plate with the bases loaded. After Markakis looked at a strike, Penny twirled a curveball that dropped below Markakis's knees. It looked like a good pitch, one of the better ones Penny had thrown all inning. And then Markakis swung. "I watched the video," Penny said. "I think he was sitting on it. He hit a great pitch." Markakis's uppercut launched the ball to center, fading right and carrying far. Ellsbury chased, ran out of ground, and watched it fall into the stands for a grand slam. Markakis crossed with the inning's seventh run. "Stuff-wise, I felt great," Penny said. "I haven't had that kind of stuff in a while. The walks killed me. That's uncharacteristic for me. I just lost it for a little bit." Penny survived the second and made it through the third, but when he walked Adam Jones, his fifth free pass, to lead off the fourth, Francona pulled him - not for Hunter Jones, tellingly, but for Delcarmen. Jones, fresh from Triple A Pawtucket, would have been the mop-up choice. Delcarmen emerging from the bullpen signified that Francona thought the Sox could win. An offensive outburst had given Francona hope. Maybe it helped, in a cosmic way, that Guthrie occupied the mound for the Orioles. He also started May 13, 2007, when the Red Sox trailed, 5-0, in the ninth and won a game that would come to be known as the Mother's Day Miracle. The second pitcher that day was Danys Baez. The second Orioles pitcher last night? Baez. "There were," Francona said, "a lot of things that happened."